Most of the pictures on this web page are thumbnails. Each thumbnail is ¼ size and ¼ quality of the full image, approximately 3K bytes. Each thumbnail is a hyperlink to a full image that is approximately 42K - 103K bytes. 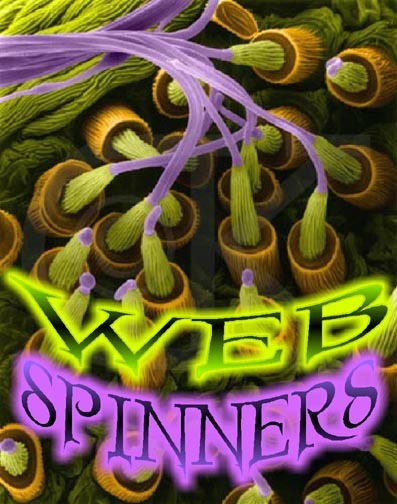 Denny Dahm's Terror by Design Web Shooter ($89.95) is the premier, web-fluid web spinner. It is the only commercial web-fluid web spinner that has blade edges that are protected by rubber edging to improve safety. It is (likely) the only commercial web-fluid web spinner with a counter-clockwise orientation (it doesn't require a reversible drill). And (I suspect) the Web Shooter generates a higher airflow (cubic feet per minute) than any other commercial web-fluid web spinner. 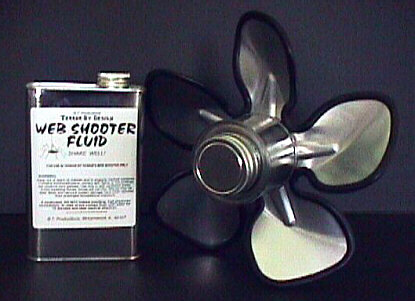 The Web Shooter comes with one pint of web fluid (a $19.95 value). Terror by Design also produces the premier Web Fluid. The Terror by Design Web Fluid is specially formulated to be flame retardant and easy cleaning. Other brands of web fluid tend to stick like glue and require special solvents. The Terror by Design Web Fluid is also available in an UV (ultraviolet) formula that glows under black light. Hollywood Halloween Effects' Cob Web Machine ($50.00) is a web-fluid web spinner. The Cob Web Machine appears to use a soup can!? The Cob Web Machine comes with a pint of fluid (a $12.00 value) and solvent (a $9.00 value). Star Light & Magic's Cobweb Generator ($79.00) is a web-fluid web spinner. Star Light & Magic could not (would not?) tell me who manufactures their Cobweb Generator. The Cobweb Generator comes with a pint of fluid (an $18.00 value). The Haunted Yard's Web Spinner is a do-it-yourself web-fluid web spinner. I built a web-fluid web spinner based on The Haunted Yard's plans. The keys to an effective DIY web-fluid web spinner are a high airflow fan blade and a metal can will small holes. The Haunted Yard recommends a McMaster Carr 8" diameter, 27° pitch, hub-type, clockwise, five-wing fan blade. Grainger sells an 8" diameter, 23° pitch, hub-type, clockwise, five-wing fan blade. These are almost identical Airdrive fan blades. The only difference is the pitch of the fan blades and the resulting airflow. Airdrive also sells an 8" five-wing fan blade with a 37° pitch. Notice how the airflow increases with the pitch of the fan blade. The 37° pitch offers an increase of almost 40% in the airflow over the 23° pitch. The higher the airflow the better. I couldn't find the 37° pitch Airdrive fan blade, so I opted to increase the pitch of the fan blade myself. I simply positioned a 1/2" x 1 1/2" x 6" piece of scrap wood behind each blade (one at a time) and bent the blade to a pitch of 37° (by hand). An 8" fan blade should be 1 3/4" wide corresponding to a pitch of 37°. Refer to the Airdrive five-wing specifications. The picture on the left shows the McMaster Carr 17545K82 fan blade with its original 27° pitch. 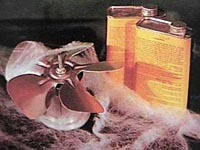 The picture on the right shows the Grainger 4C475 fan blade bent to a 37° pitch. This type of fan blade comes with and without a hub. A hub is a metal collar with a set screw. The hub should help to ensure that the fan blade is square with respect to the shaft. Either style will work. The Grainger 4C475 and the McMaster Carr 17545K82 are hub-type blades. This type of fan blade is available in a clockwise or counter-clockwise rotation. 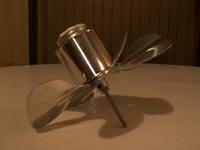 A fan blade involving a clockwise rotation will require a reversible drill spinning in reverse. The Grainger 4C475 and the McMaster Carr 17545K82 involve a clockwise rotation. You can use a four or eight ounce PVC cement (or PVC primer) metal can that is probably lying around your garage. Simply cut the brush from the lid of the can. Again, a key to an effective web-fluid web spinner is the size of the holes in the metal can. The Haunted Yard recommends two 0.032" holes that would be made using a #67 wire gauge drill bit. The smaller the holes the better. 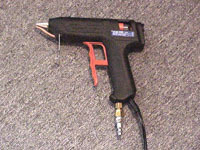 I used four 0.025" holes using a #72 wire gauge drill bit. You can find a Tip Drill set with an assortment of wire gauge drill bits and a pin vise for $10 in the welding section of your local hardware store. A few words of caution... The inside lip of these metal cans can be extremely sharp. Use caution when cleaning out the can! 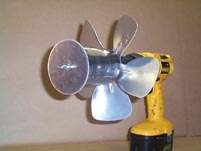 Most important, please treat an unprotected fan blade spinning in a drill at 3,000 RPM with caution! Picture your hand inside of a large blender. Ghost Ride Production's Cob Webber ($286.00) is a pneumatic, hot glue gun web spinner. The Cob Webber claims to blow webs up to 30 feet. The Iron Kingdom's Web Weaver ($149.50) is a pneumatic, hot glue gun web spinner. All-Hallows-Eve Cob Webber is a do-it-yourself pneumatic, hot glue gun web spinner. 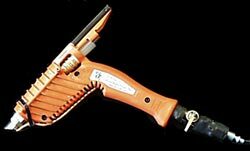 Pete Rondeau's Webster is a do-it-yourself pneumatic, hot glue gun web spinner. 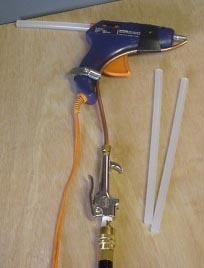 I built a pneumatic hot glue gun web spinner based on Pete's plans. I found that 1/4" copper tubing obstructed the hot glue gun trigger. I opted to use 3/16" tubing. This required that I use an 3/16" compression x 1/8" MPT fitting and a 1/4" x 1/8" brass reducing bushing. I had originally planned on using a 1/4" brass ball valve. Pete recommended that I use a 1/4" FPT x 1/4" FPT slide safety valve. The safety valve has a collar that slides to shut-off the flow of air. The safety valve was expensive, but it works great! I positioned the 3/16" compression x 1/8" MPT fitting and the 1/4" x 1/8" brass reducing bushing such that they straddled the shell of the hot glue gun handle. 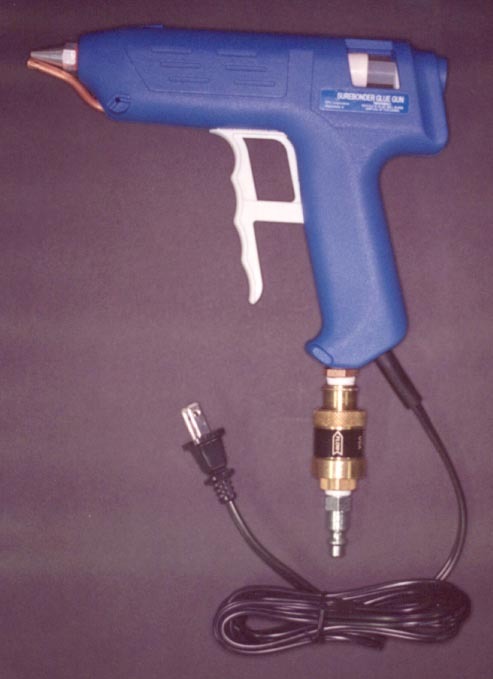 This increased the rigidity of the safety valve and quick-disconnect assembly.